Cover Design by W.C. MATTHEWS & CO. 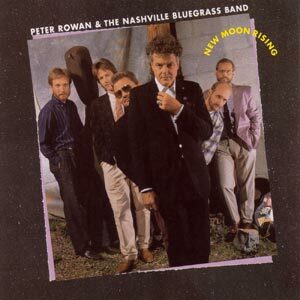 Between the work that Alan had done with Peter Rowan, John Starling and The Bluegrass Band plus Pat's work with Tasty Licks and The Dreadful Snakes (with Pat Hembree) they felt that they had a good base to build on. By now you can probably tell that I'm very excited aout these guys. I'm sure that you will be too. Up Above My Head was written by the great gospel singer, Sister Rosetta Tharpe. Its short message really appeals to us. Alan learned Carroll Country Blues from Uncle Birch Monroe. Endless Sleep is an old pop song that, thematically at least, fits right in with traditional country music. It has a happier ending than most songs of this type, though. We learned The Prodigal Son from The Heavenly Gospel Singers, an amazing quartet that was popular in the 1930s. They were fantastic singers. Blue and Lonesome and Doghouse Blues are vintage Bill Monroe. We're not sure he would approve of the backup singers on Doghouse, but we're behind them 100 percent. Brand New Tennessee Waltz is one of Jesse Winchester's finely-crafted tunes. We use a high lead harmony on this one. Baby Blue Eyes and On My Mind are both associated with the late bluegrass giant Lester Flatt. Blaine Sprouse's fiddle mades these songs sparkle. Monroebilia is Mike's idea of a fiddle tune that Bill might have written late art night riding on his bus somewhere. We've heard several versions of Blind Bartimus, a story from the New Testament. Our version comes closest to that of The Harps of Melody, a six-woman group from Memphis. My Native Home comes from the Carter Family. We hope you enjoy the songs and tunes we're selected for our debut album. We feel they are representative of our repertoire and include some of our personal favorites. • Maura O'Connell appears courtesy of PolyGram Ireland and Rounder Records.